Nova was Marvel’s mid-1970s attempt at recreating the ‘average kid gets superpowers’ magic that essentially catapulted the company into superhero success 14 years earlier with Spider-Man. To it’s credit, Marvel didn’t take the easy way out and copy Spider-Man’s origin verbatim. Instead, they took the even easier way out and copied Green Lantern’s origin verbatim: Dying member of an intergalactic police force transfers his power to a hapless earthling. But instead of being a cocky, brash pilot like Hal Jordan, the new Nova is an insecure poindexter like Peter Parker. Original, yes? Umm…no. Although the character’s first series fizzled after 25 issues, attempts have been made over the years to utilize the character in various comics and plotlines, most notably in the early 90’s teen book The New Warriors. However, no matter how hard the character was pushed, he never really amounted to much. In fact, the character is very similar to Moon Knight, in that his costume is really the only thing he has going for him. When you take that away, all you have is a very poor man’s version of not just one, but two other characters. Until now. About 4 years ago, Dan Abnett and Andy Lanning decided to use the Nova character as a major player in their Annhilation Wave epic, and the character hasn’t been the same since. Abnett & Lanning essentially put this character into the forge, stripped away everything that we knew about him, and rebuilt the character from the ground up. 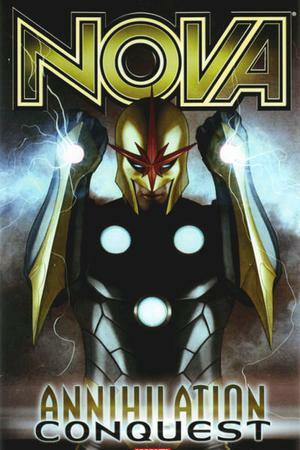 And now what’s left is a confident, extremely powerful hero that can hold his own with pretty much any of Marvel’s A-list villains: Nova. Which brings us to one of the better Marvel titles in recent years, but one that unfortunately requires you to read pretty much everything else Abnett & Lanning have been writing so as to fully understand what’s going on. Not that that’s a bad thing, as they’ve been turning out some great Marvel sci-fi epic storytelling. But those who are just looking for a simple, straight-forward superhero book that can stand on it’s own two feet might want to look elsewhere. 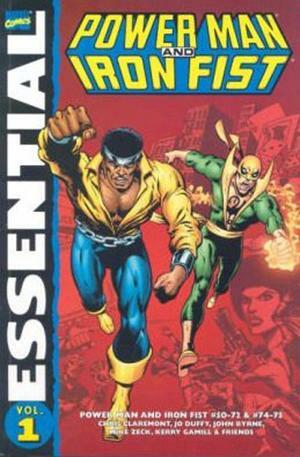 When I was a kid, Power Man & Iron Fist might have been my favourite comic book. I waited for every issue like a dog waiting for a porkchop. And since the World Wide Web wasn’t available at the time, the cancellation of this book was a real surprise to me. So why am I getting rid of this? It’s not because of the quality of the book. The title focused on two characters that had been in their own low-selling books: Power Man (better known today as Luke Cage), and Iron Fist, and as such was essentially a mash-up between Shaw Brothers-style Kung-Fu & Pam Grier-style Blaxploitation. And it was glorious. It had a little bit of everything I love about superhero comic, and because it was one of Marvel’s lowest selling books, seemed to deal with subject matter that other comics weren’t touching at the time. Unfortunately, the only way you can get this series in collected form is in the oversize black & white Essential trade paperbacks, and as I’ve previously noted, they just don’t give colour comics their fair shake. Although I still love this series, I’ll have to do without it until Marvel reissues it in a format that does it’s original source material justice. The Pulse was Marvel’s attempt at a follow-up to their high-on-acclaim, low-on-sales title Alias, and their hopes were that this would get the high numbers the previous series lacked, as well as continuing to get great reviews. It received neither, though it definitely deserves more credit that it gets. 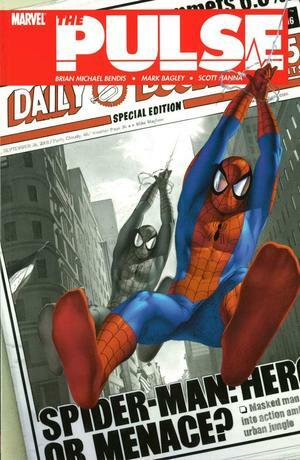 It’s essentially the story of Jessica Jones, a former superhero-turned-private eye, who has been hired by J. Jonah Jameson to help Ben Urich uncover super-related stories for the Daily Bugle. It’s a sound premise, and one that should have been a good companion piece to Bendis other series about normal people who get pulled into the bizarre realm of super-heroics, Powers. However, Powers only has to stay relevant to itself, and the Pulse quickly got pulled into the bazillion-and-one subplots are running through the Marvel Universe at any one point. And so what should have been a small, character piece about journalism in a super-powered world became exactly what we didn’t need: Just another superhero book. While it’s still very readable, especially for fans of Jessica Jones or Luke Cage, the comic quickly becomes so watered down from it’s original intent that one wonders why they even bothered doing this series in the first place. This entry was posted in Comic Books and tagged Alias, Brian Michael Bendis, Comics, Iron Fist, Marvel, Nova, Power Man, Pulse. Bookmark the permalink. The Great Comic Book Cull Of 2010/2011 Part 49: Marvel Comics – Ms. Marvel, New Mutants, NewUniversal, Nextwave, and Nick Fury! Wow…you got rid of a classic and kept two modern POS comics just because Essentials are in B&W!